The World's Richest horse race is here. The Pegasus World Cup of racing has more than $17 million on the line this Saturday. The Gulfstream Park card hosts nine stakes races with at least $100,000 in prize money. On Saturday, you can see who we think will win every Gulfstream Park race here. You can watch the Pegasus Cup Invitational races on NBC, coverage will start at 4:30 p.m. ET. It should be quite a show, at the track and on TV. Rapper, Snoop Dogg and DJ Mark Ronson are scheduled to perform after the BIG races. It should be a great day of entertainment and horse racing. But the headliner for horse players is the PEGASUS WORLD CUP INVITATIONAL STAKES. 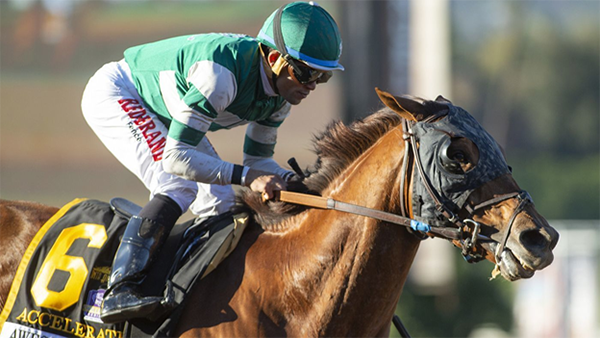 The big question is who can beat the 9/5 morning-line favorite, ACCELERATE (PP: 5). It is the last race for the six-year-old before he retires to stud. ACCELERATE is the third Breeders' Cup Classic winner to race in the PEGASUS WORLD CUP INVITATIONAL STAKES. He'll look to follow in the footsteps of ARROGATE and GUN RUNNER and win the $9 million race with ease. According to the oddsmakers, the 2018 Horse of the Year runner-up, ACCELERATE's biggest challenge will come from CITY OF LIGHT (PP: 3 ML 5/2). The Breeders' Cup Dirt Mile winner posted the highest, last race speed figure and should factor heavily in the outcome. He got out to a quick lead and never looked back, running crisp fractions: an opening quarter of 22 and three and 45-seconds at the half-mile marker. ACCELERATE and CITY OF LIGHT have matched up twice before, each winning once. ACCELERATE got the better of it in the Grade I Gold Cup at Santa Anita with CITY OF LIGHT running third. Meanwhile, CITY OF LIGHT took home the top-prize by a neck over ACCELERATE in the Oaklawn Handicap. The PEGASUS WORLD CUP INVITATIONAL STAKES is the rubber match! GUNNEVERA (PP: 8 ML 8-1) is the third choice and ran second to ACCELERATE in the Breeders' Cup Classic. Unlike ACCELERATE clean trip in the BC Classic, GUNNEVERA had all sorts of issues at Churchill Downs on November 3rd. He was "bumped soundly at the start," and "altered out and split horses in the stretch." Despite all the trouble, GUNNEVERA finished a length behind ACCELERATE, making up 3 1/2 lengths in the stretch. While our handicapper agrees with oddsmakers on the order of the top three contenders, he lines them up a little differently in our Pegasus Cup Wagering Guide. "All signs point to ACCELERATE coming to the track ready; three straight bullet works and four straight wins. He's won three of four at the distance with a third. He's the one to beat. GUNNEVERA finished third here last year. He looks like he is rounding into top form and ready to challenge ACCELERATE. He might have got to the top choice in the Breeders' Cup Classic if not for a rough trip. CITY OF LIGHT just ran a "cracking pace" in wiring the field in the Breeders' Cup Dirt Mile. If he can run the same race, he should get a similar result. The Kentucky Derby show horse, AUDIBLE lost as the $0.10 favorite in his last, but it was on the slop. Trainer Todd Pletcher wins at 24% with dusted chalk. Meanwhile,AUDIBLE has five wins in six starts on a fast surface, oh for two on an off track." Our Pegasus Cup Wagering Guide includes commentary on top contenders, value and longshot plays, early race set up, each horse's running style, picks and suggested bets for all nine $100,000 or more stakes races. We'll also be on the ground in Hallandale Beach, Florida with live updates, pictures, and insights from Gulfstream Park. Make sure you check in often on Saturday.